Understanding your target market is vital to the success of a business and nonprofit. Your company provides solutions for people, so it is a good idea to start with the person first. You can do this by creating user personas that will direct your business. Think about who your audience is so you can create a great solution to their needs. Without knowing who you are serving, you will not be able to meet their needs and desires. Creating a user persona does not have to be an intimidating task. Take your existing customers and group them together based on their needs and desires. This process cannot be done at your desk. You will have to talk to your customers to validate your assumptions. The best way to build user personas is by thinking about the needs and desires of your customers. Let’s take a look at the steps to build great user personas in a little more detail. The gaps between your user’s needs and the solutions they have today are where your products and services survive. You have to identify your users, then define, examine, and address the pains of those individuals. This is the only way you can provide value to meet their needs and increase revenue. The first thing to do is to look at the main responsibility of your customer. The first thing to do is to look at the main responsibility of your customer. For example, a single mom worries about being able to make healthy meals for her 2-year-old son because she doesn’t have much time. Another example is a lawyer who worries about finding a new secretary because the last one just quit during the busy season. Each user persona has different needs and desires. If you understand the pains of each group, you can align your business to solve their needs. Your business will be able to create unique content to help each one at specific times of their customer journey. Understand the primary roles of your user. Then see how it relates to their pains, you can get a strong sense for what they want to gain from using a product or service like yours to find a solution. The desires and expectations of your customers include the goals your audience is looking for. Each person will seek different goals by using a product and service. This desire is not just based on the immediate relief they receive. For example, let’s take the single mother again. We know her primary role is a single mother of a 2-year-old son. We know she doesn’t have a lot of time, and she is pretty stressed. She cares about the health of her child (as any good mother does) and doesn’t want to be feeding her son McDonald’s every night. After validating the desires of this mom, you could find she wants to be seen as a healthy mom. This is why she does not go to McDonalds. As a result, there is a potential market for fast food that is healthy. You can come to other conclusions based on validation and discover other market opportunities. Immediate pains customers feel are not always the main driver of their choices. Many times customers look to products and services that meet superficial gains they desire. For example, some people lease expensive cars. This decision is often influenced by factors outside the need for transportation. Instead of leasing an expensive car, the individual could have bought an older car or taken the bus. This is just one example of how superficial gains can drive our decision-making process. People weigh their options differently when making a decision. User personas will help your business group similar individuals and have more effective messaging. Your business serves people by providing solutions to their needs. Your products and services provide a way for people to reach their needs and desires. Whether they want to eat healthier or have a car, people have many options. User personas can help your business group your customers together and make your marketing more effective. 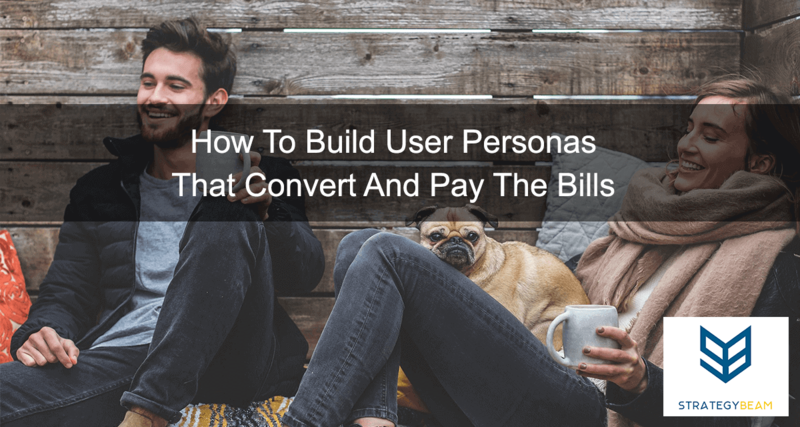 User Personas also help you save time and money. Think about how you can create user personas based on the needs and desires of your customers! Now it’s your turn. What benefits have you seen by building user personas for your business? Let me know in the comments below!